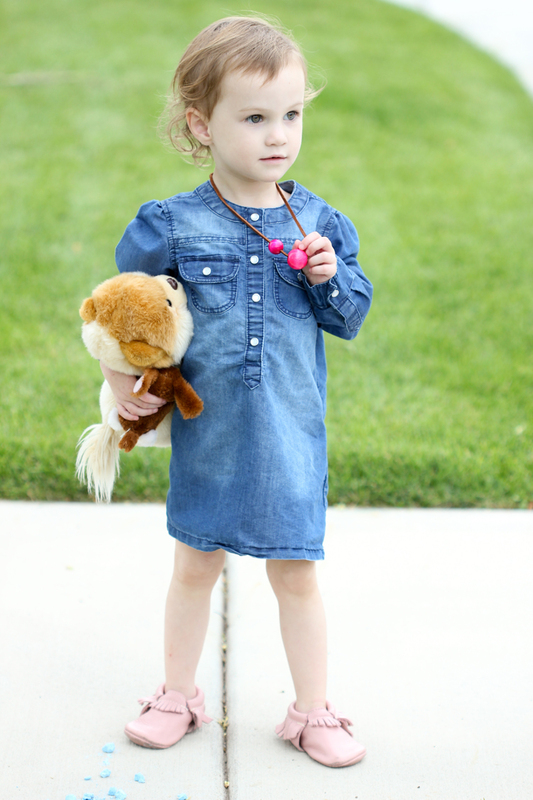 My Natalie is 2 and starting to love all things girly girl. Necklaces are at the top of her list of favorite accessories. She is always asking to wear one, so I thought we would DIY one together! 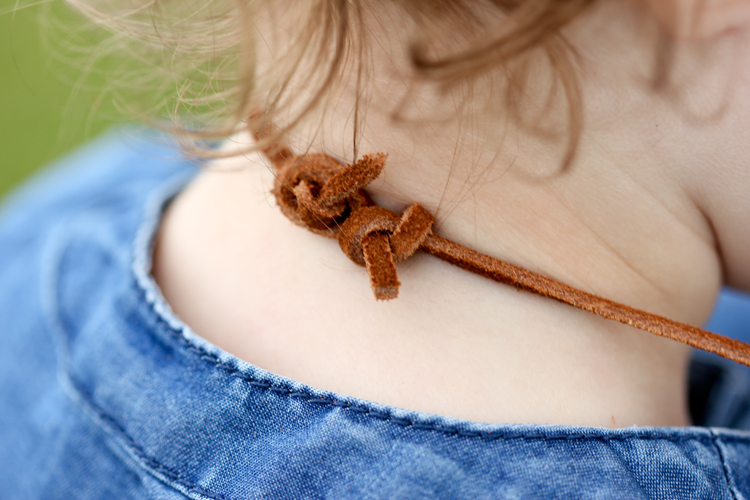 Instead of installing a clasp or just knotting the necklace, I came up with another way for the necklace to stay on, but pull apart easily enough in emergency situations to help prevent strangulation. The leather cording will also snap if tugged on very hard, so that adds another element of safety. Of course…I have to add the disclaimer that it is not fail proof. 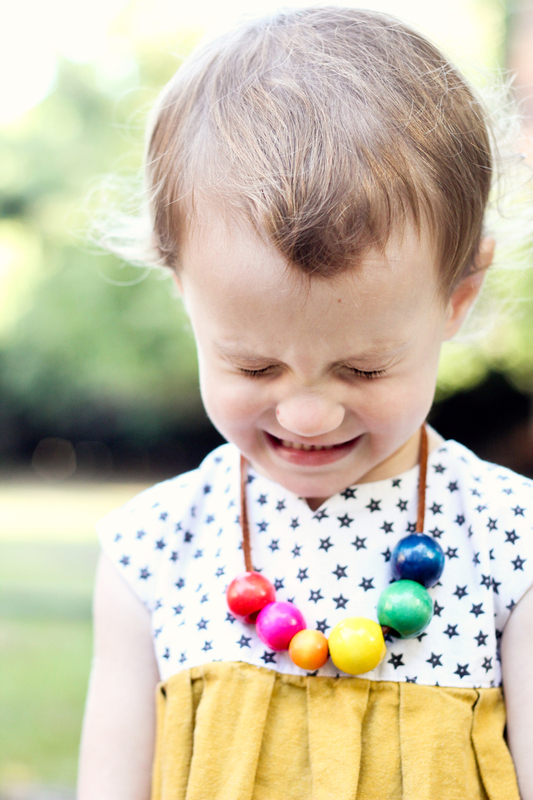 Always supervise your children when wearing the necklaces, as the beads may also pose a choking hazard. :) Good? Alright! Let’s get to the fun stuff! 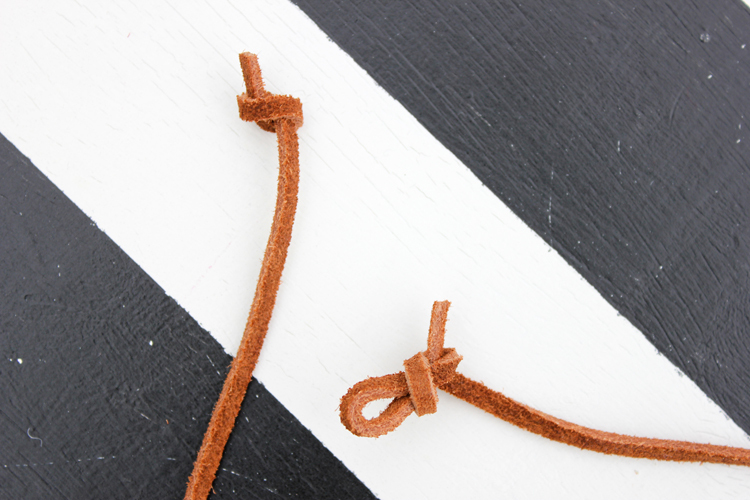 Cut leather cording to desired length + 5 inches for knotting. 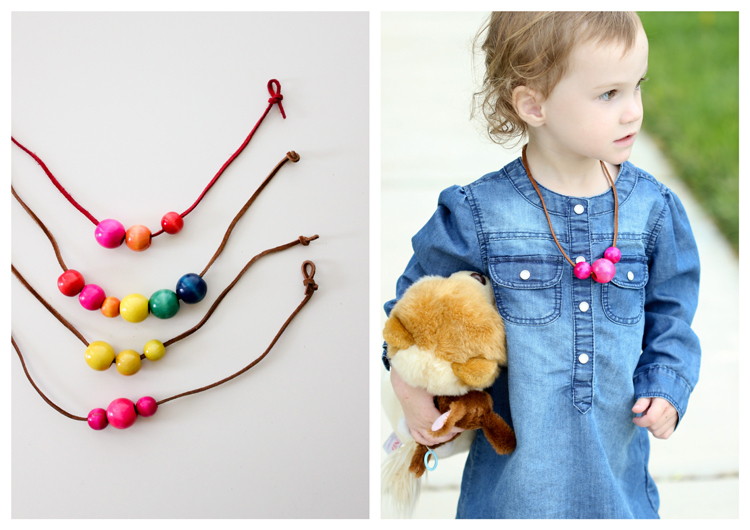 Assist your child in stringing the beads on the leather cording. 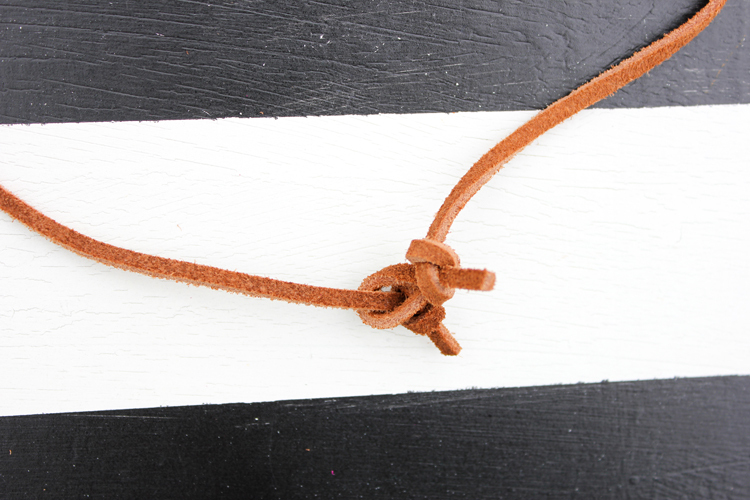 There is a knot and a looped knot. To close the necklace, insert the knot into the loop. 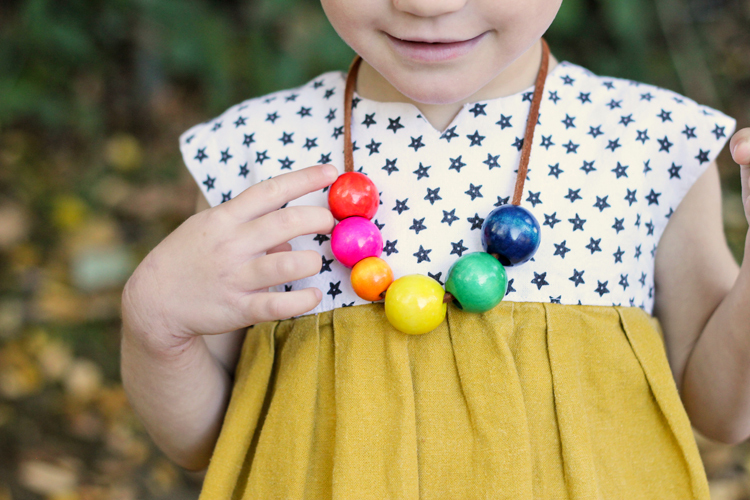 Note: This “clasp” is toddler friendly in that if it gets pulled on it will come a part to prevent strangulation, but your toddler will still likely need help putting the necklace on and off. 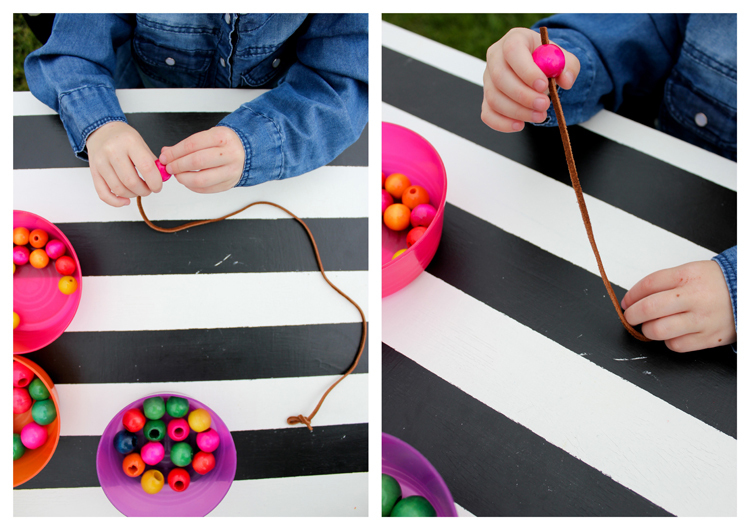 The loop and knot can be tricky for little fingers to manage independently. The great thing about this project is that it’s part crafting and part educational. 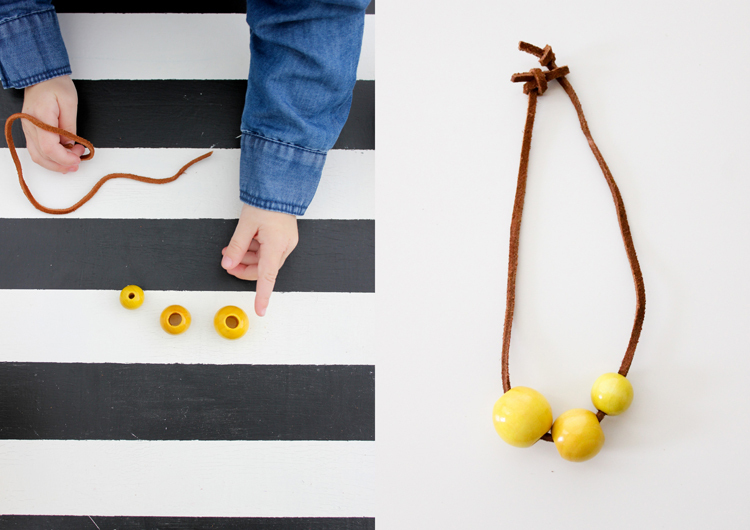 You can tailor how to present the beads to your child to create different learning experiences. 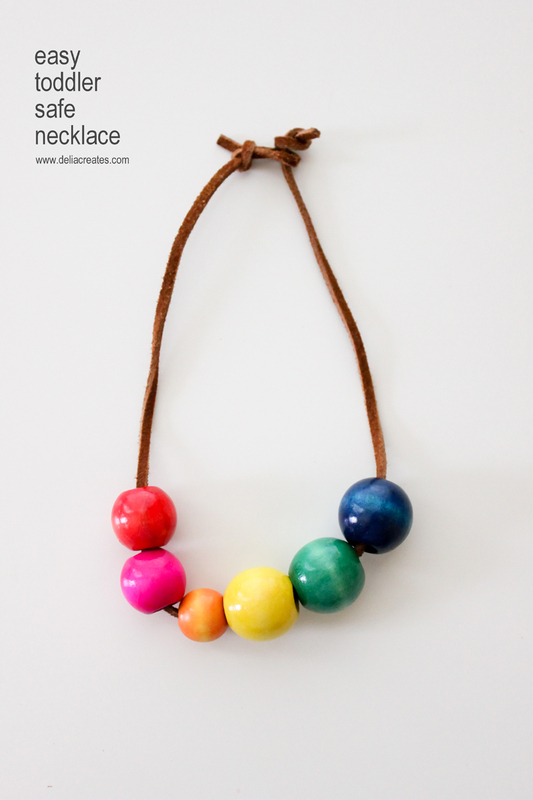 – Sort the beads by color or size and place them in coordinating dishes before making a necklace. Talk about what else is the same color as each bead. 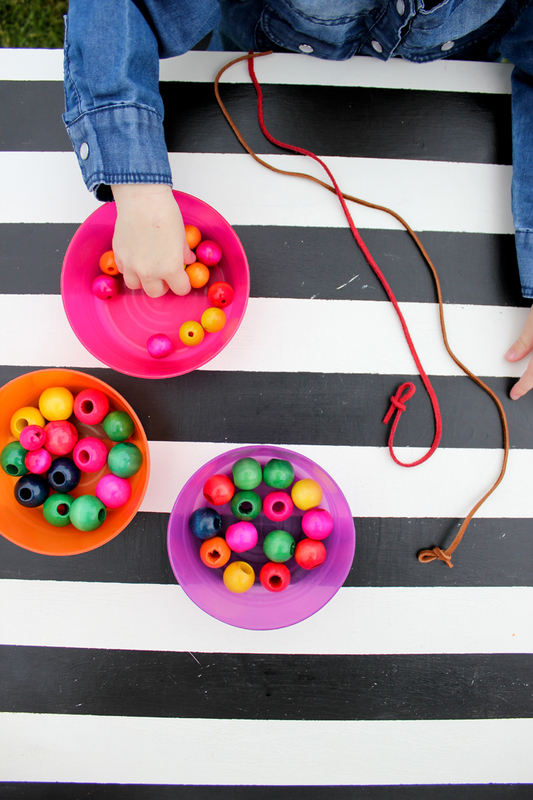 When the necklace is complete, do a color scavenger hunt around the house to find other items that match the beads. 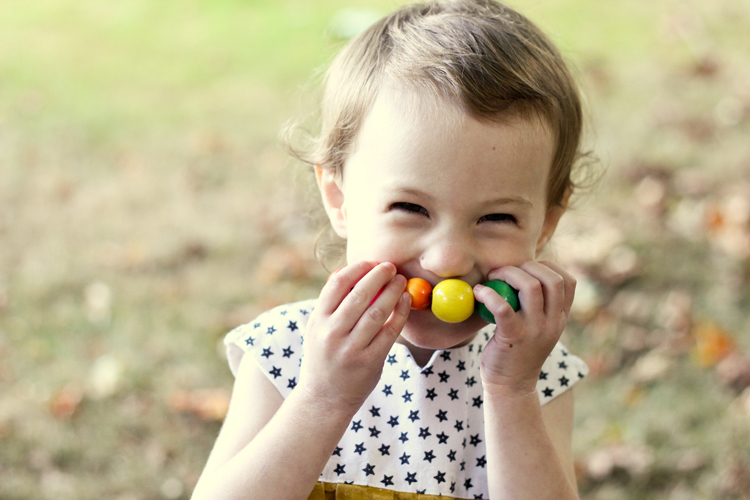 – If having all the beads out at once overwhelms your child, set aside a smaller selection. 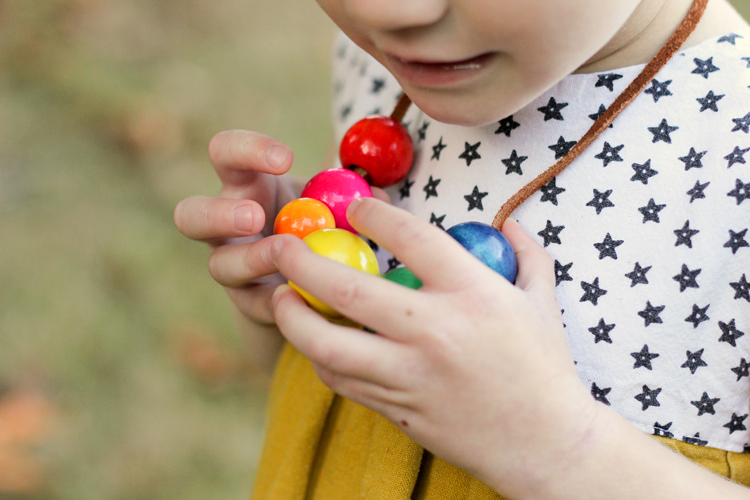 Maybe choose just one color and focus on the different sizes of beads, and then categorize them (talk about big, bigger, and biggest). – Count the beads as you string them on. – Create patterns. Alternate colors and sizes. 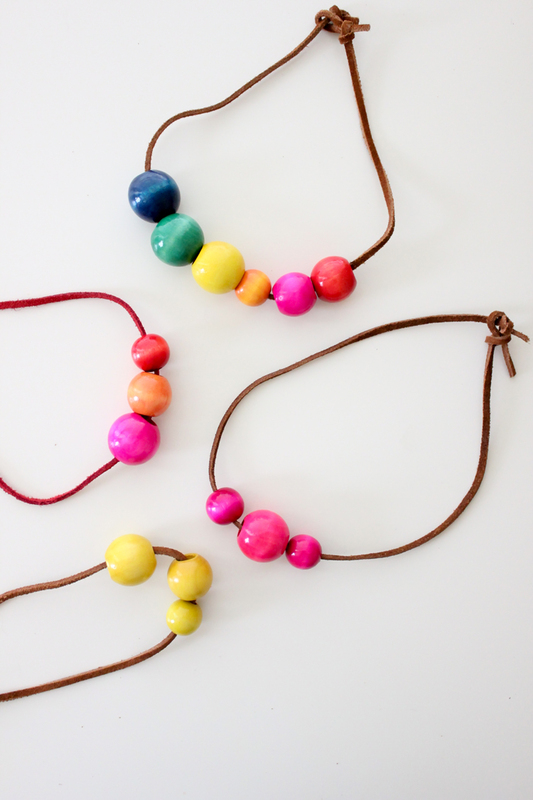 Another perk is that these necklaces are inexpensive and easy to replace. If one becomes lost, chewed on, or broken, no problem. 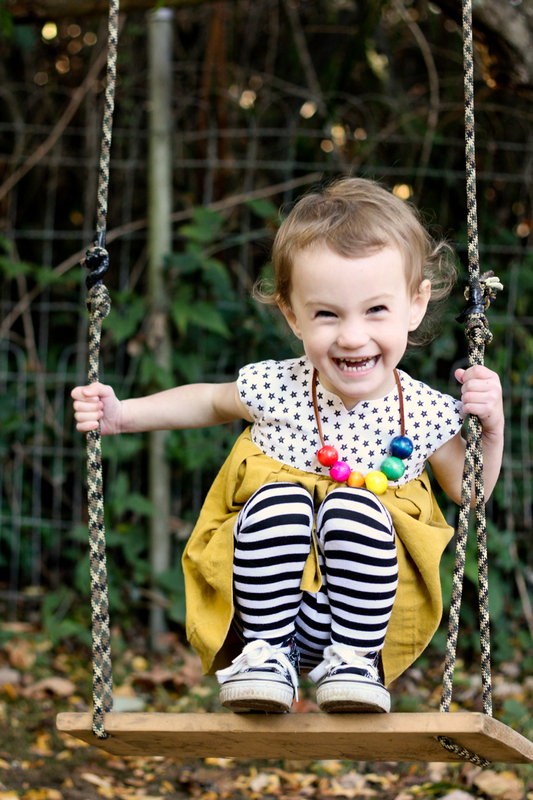 Totally toddler friendly! 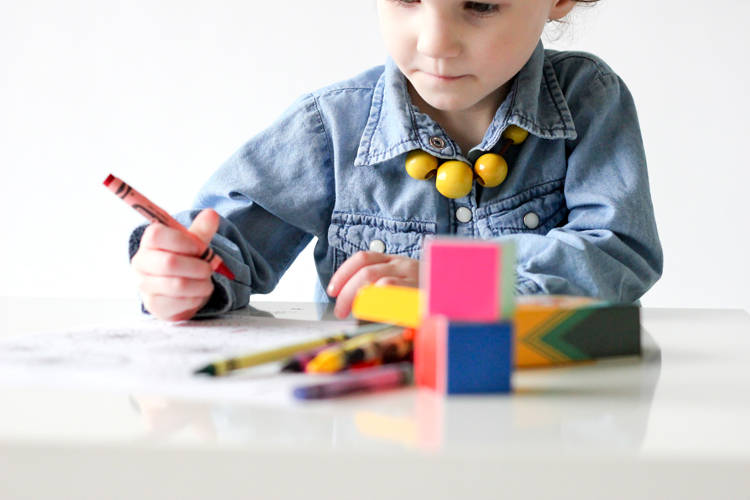 If your child doesn’t like the painted wooden beads, maybe try small faux flowers, a felt bow, or other shapes of beads that you paint together. 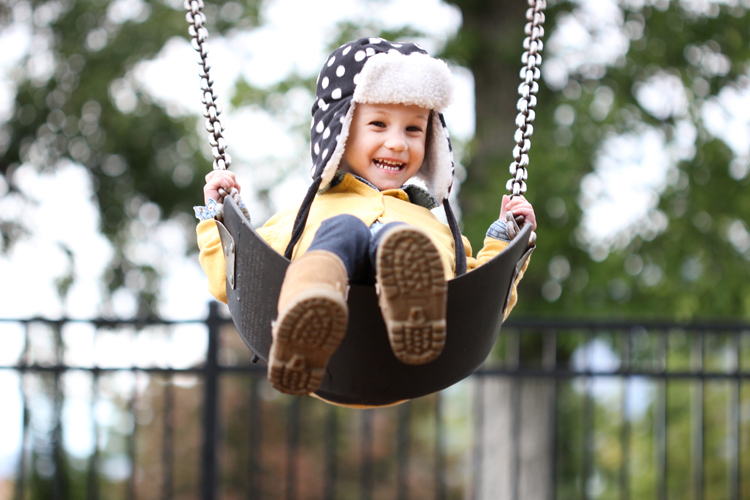 Just try to keep it to toddler friendly materials to keep things safe and fun. 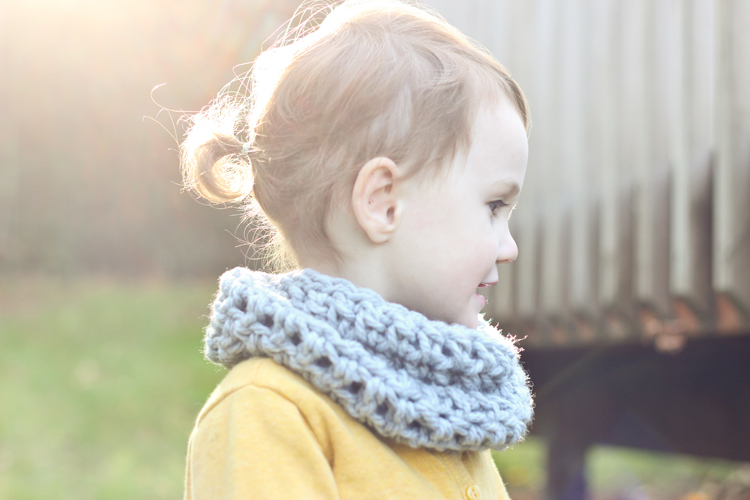 Wood + Felt Bead Diffuser Necklace Crocheted Toddler Cowl Scarf – Free Pattern Toddler Coloring Dice Dishwasher Safe Painted Dishes Toddler Ear Flap Hat – Free Pattern! Oh gosh, these are the cutest! I love the scale of the big shiny beads on her little body. I happen to have some extra red leather cording leftover from a recent project. Yay! These are awesome. 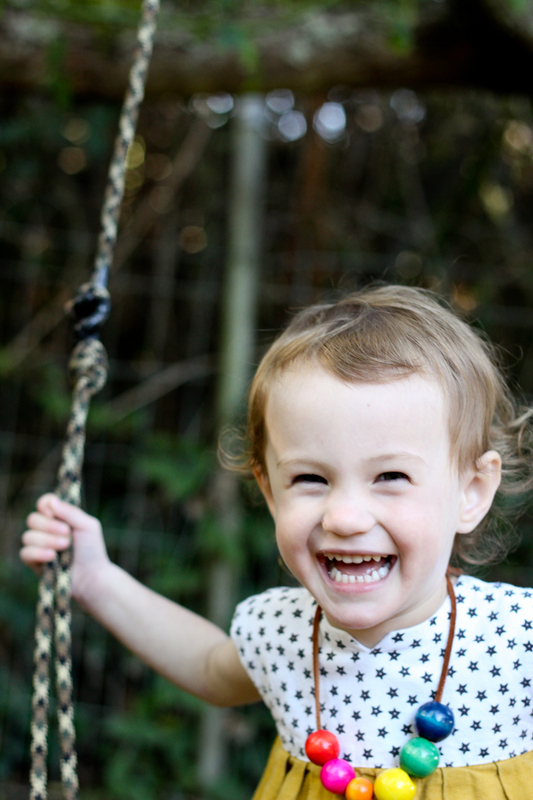 I bet one of my boys would love to make one for my two-year-old daughter for Christmas. Thanks! Thank you Kristi! What a great idea to make this a sibling gift! My little girl is like Nat Loves everything girly! She is lucy having a big sister who try to help her doing this mind of things, and another big brother to play with cars too! Ooh, I love this idea! I have never ventured into the jewelry hardware realm, so this is right up my alley ;). 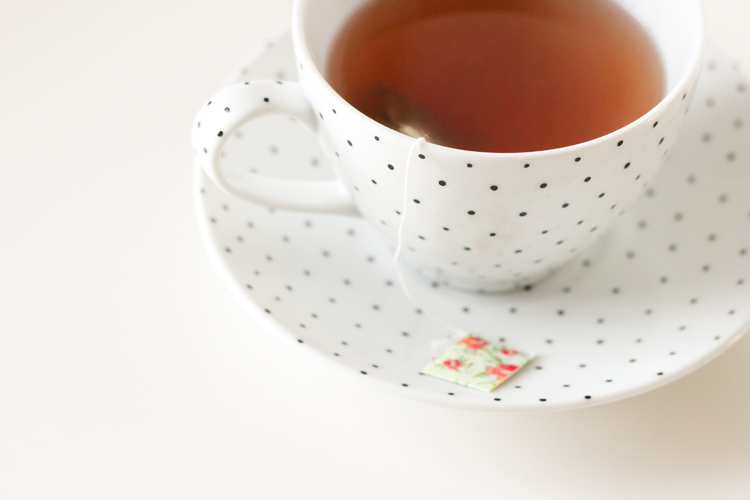 And I love that I get to see WA photos on your blog now :). Hi Delia! Great idea, I thought I’d make a couple for my LO’s second birthday party for her friends to take home. Could you link to the beads you bought? I’m having trouble finding them on the website. I love the idea of making them party favors! LOVE this! 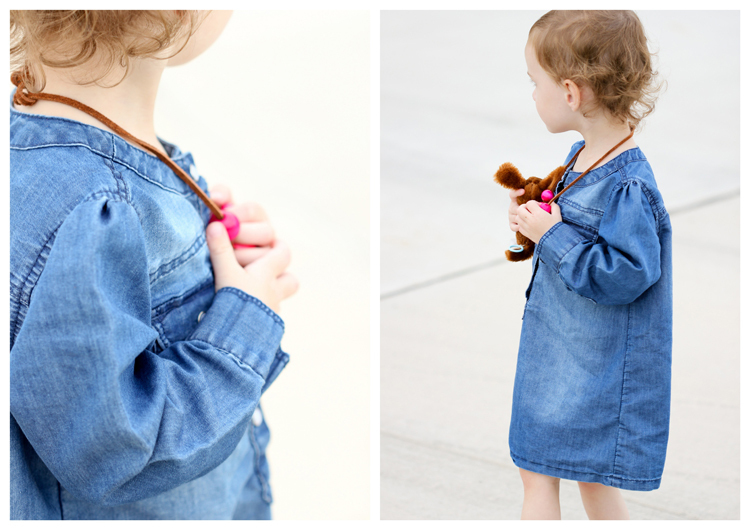 So adorable and love that it’s simple enough for little ones to be able to help! Thanks! Oh My! Is there a pattern for the star dress????? I adore it and work love to make for my little chicken. Aw thanks! 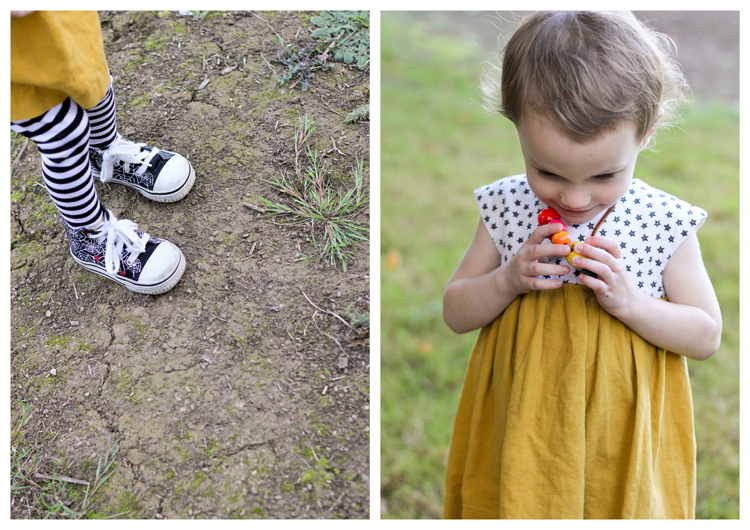 It’s the Geranium Dress pattern from Made By Rae! I love it! 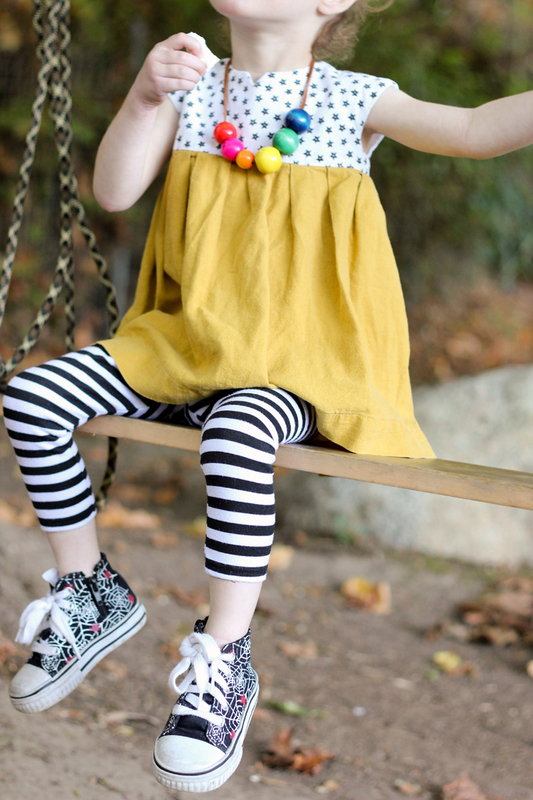 The fit is amazing and seems to grow with kids well.